More than 78,117,743 beer lovers served! Hours: Open Monday-Saturday at 11:30am, Sunday at 11:00am. Bohemian brewing system, typical Bohemian beer lineup. Chapel Hill needs more parking spaces, and less agressive drivers. 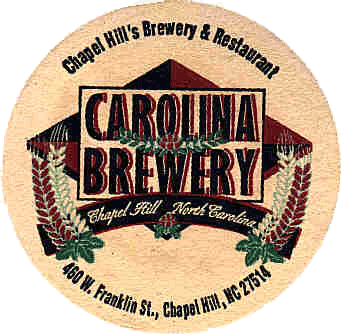 Carolina Brewery was voted "Best Brewpub in the Southeast" and the "Triangle Brewpub of the Year" for 2000 and 2001. Red, low carbonation and head. Smells a little fruity. Good body, good spicy hop flavor. Amber-brown, flat, no head. Citrus aroma. Good body, lots of citrus hop flavor and finish. Pale, low carbonation and head. Smells very sweet. Tastes sweet and bitter. Odd balance. Black, good head. Very roasty aroma. Thick, dark, burnt, sweet, smoky.